Military Style Rothco Soft Shell Tactical M-65 Jacket Coyote Brown Made From 100% Waterproof Polyester Material, Inner Fleece Lineing Made From Lightweight, Breathable, & Moisture Wicking Material. Hook & Loop Neck Closure Concealed Hood With Zipper Closure. Zipper Front & Snap-Up Storm Flap With 6 Snaps Right Hand Zipper Pull When Worn. Large Breast Pockets With One Snap Closure Snap Is Concealed. Large Waist Cargo Pockets With One Snap Closure Snap Is Concealed. Hook & Loop Wrist Cuffs For Attachment To Gloves. 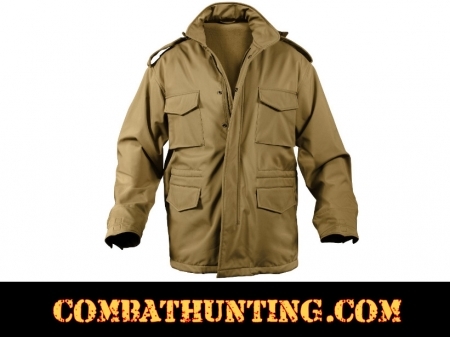 Hood Drawstring, Bottom Drawstring Interior Waist Draw Cord and Button Down Epaulettes.